Grease 36 mini muffin cups or line with miniature paper baking cups. Make brownie batter as directed on package, using water, oil and eggs. Fill muffin cups about 3/4 full (about 1 tbsp/15 mL batter each). Bake 14 to 17 minutes or until toothpick inserted in centre comes out almost clean. Cool in pan 20 minutes. Carefully remove paper baking cups; place on cooling rack and cool completely. In 1-qt (1 L) saucepan, heat whipping cream over low heat just to boiling. Remove from heat; stir in chocolate chips until melted. Let stand about 15 minutes or until mixture coats a spoon. Spoon about 2 tsp (10 mL) chocolate mixture onto each brownie. Garnish with fresh raspberries if desired. Simplify: Bake brownies in an 8-inch or 9-inch (20 cm or 23 cm) square baking pan according to package directions. Top with ganache. 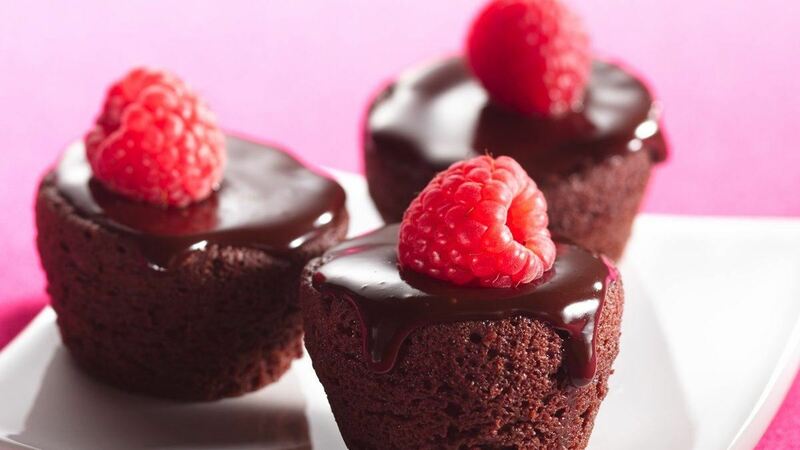 Cut into small squares and serve in miniature paper or foil baking cups.